The former Athetico Madrid ace proved why he is regarded by many as the best goalkeeper in the world with a brilliant display against a highly determined Spurs, and his team-mates were quick to pay tribute to him following the game. The 28 year old made a string of fine saves – including 11 in the second-half – to deny Harry Kane and co as United held on to their lead after going ahead courtesy of a first half goal from Marcus Rashford. ‘Man like @d_degeaofficial’, wrote Romelu Lukaku as he shared a cartoon of De Gea pulling a barrier down to cover the goal with the words ‘sorry, closed on Sunday’ written on it. Luke Shaw tweeted the same image. Midfielder Ander Herrera followed suit, posting a photo of himself and the goalkeeper hugging at the final whistle with the caption ‘no words @d_degeaofficial’. He would later share a story from the team coach, placing a top hat emoticon on De Gea’s head. De Gea himself also tweeted, calling it a ‘perfect night at Wembley’ along with a picture of him celebrating at full time. Compatriot Juan Mata went for a sarcastic approach as he responded ‘nah, average’ to De Gea’s tweet about it being a ‘perfect night’. He then wrote ‘I know you all felt like me’ in response to a clip from Sky of himself staring in amazement at De Gea at the end of the game with the caption ‘find someone who looks at you the way Juan Mata looks at David De Gea’. The love-in did not stop there as Victor Lindelof and Andreas Pereira both took opportunities to post images with the man of the hour on United’s train back to Manchester. 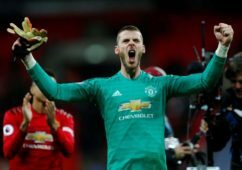 The praise for De Gea continued to pour in from the footballing world, with his former united team mate Darren Fletcher declaring him the best in the world.